Powers of attorney are essential components of any comprehensive estate plan, as they provide specific plans for what should be done in the event that person becomes incapacitated in the future. While powers of attorney can be tailored to a person’s specific needs and wishes, they can range from being very limited in their powers to being extremely detailed and empowering. 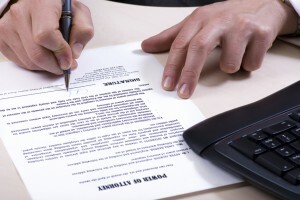 Not updating a power of attorney is a common mistake people make. When you are ready to develop a power of attorney, contact JR Phillips & Associates, PC. It’s important, however, to point out that the process of developing a power of attorney can be just as critical as having this authority in place. In fact, if people don’t take the time to develop a proper power of attorney that appropriately covers their wishes and needs, they could end up creating more challenges for themselves or their loved ones in the future. In this three-part blog, we will discuss some of the most common mistakes that are made when people are developing powers of attorney. If you have some specific questions about creating a power of attorney for yourself and/or are ready to move forward with this critical estate planning step, don’t hesitate to contact the Denver estate planning lawyers at JR Phillips & Associates, PC. The wrong or inappropriate person being granted the authority to make medical and/or financial decisions on your behalf. Your new wishes not being properly detailed in your power of attorney documents. Other challenges or issues arising in the future that could cause your loved ones significant emotional and/or financial stresses. Another common power of attorney mistake people make is rushing to get one of these documents in place. Although developing a power of attorney may seem like a morbid or tedious task for some people, the fact is that rushing into developing these documents can lead to some serious problems, like loopholes, inconsistencies and/or unclear language. This can, in turn, trigger other challenges and issues, such as the selection of the wrong attorney-in-fact, the possibility of a chosen attorney-in-fact making bad decisions on your behalf and, in the worst cases, poor decisions being made about your life and your most precious assets. Check out the upcoming second and third parts of this blog for our continued discussion of common power of attorney mistakes to avoid. When you are ready to develop an effective power of attorney, you can turn to the Denver estate planning lawyers at JR Phillips & Associates, PC. We provide a thoughtful, comprehensive approach to our clients’ estate planning, elder law and other legal needs, and we take pride in helping each of our clients and their families find the best solutions for them. Let’s discuss your options for developing a power of attorney during an initial consultation. To schedule this meeting, call us at (303) 741-2400 or email us using the contact form at the top of this page.